Doug rants about gas and pipeline company landmen and the pressure and intimidation tactics they sometimes employ on landowners. Landowners should not be intimidated or threatened to sign any oil and gas related documents. Do not be bullied into signing agreements. Landowners must first understand their ability to decline any oil and gas related contract offers. Doug discusses pipeline ROW agreements and the need to understand your rights to the decline or negotiate pipeline offer. Doug explains why landowner must not relay on landman who may be misleading. Discussion regarding why landowners are signing bad pipeline agreements and not taking advantage of opportunities. The need to negotiate agreements to maximize money and protections. Doug explains legal consultation services and the need to understand landowner leverage in all agreements. Federal Energy Regulatory Commission (FERC) interstate pipelines and eminent domain and condemnation discussion. Doug discusses the important of understanding when eminent domain may apply and the importance of evaluating your pipeline agreement offer and understanding your ability to negotiate. Discusses the potential of eminent domain and condemnation. Eminent domain and condemnation are unlikely, but you must identify if the company will obtain those rights in the future. Doug discusses Tioga County pipeline agreement market and company offers compared to other counties in PA. Doug emphasizes that the pipeline company landman is not working for the landowner and stresses the value of landowner representation. Doug explains the financial impact of below market pipeline offers and the need to understand your rights to decline any pipeline agreement or negotiate for the highest compensation possible. 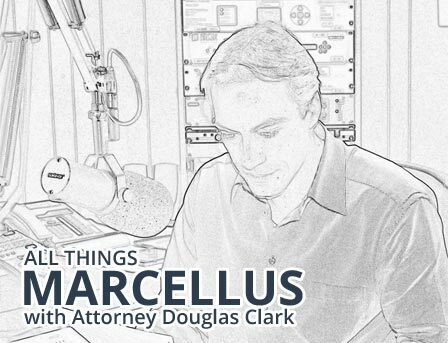 Five Year Anniversary Show of All Things Marcellus!!! Beginning of discussion regarding Tioga County pipeline agreements and need for landowner information and education. Discussion regarding execution and signing future documents after signing your oil and gas lease. What to look for when the gas or pipeline company asks you to sign agreements or contracts after you have already executed an oil and gas lease or other agreement. Be careful: future agreements may change the terms or possibly cancel language in other prior agreements with natural gas and pipeline companies. Landowners must understand what documents they are singing and what the impact will be on prior agreements they have executed. Doug discusses natural gas Pipeline Right of Way Agreements in areas of advanced gas production development and areas where pipeline activity is in its infancy. Negotiation tactics and why gas and pipeline companies offer company favored pipeline agreements and lowered compensation when first approaching landowner in regions of early infrastructure development. Doug explains why landowners who sign pipeline agreements early often receive the lowest compensation with the weakest Addendum terms. Doug discusses his landowner representation and begins breaking down royalty Addendum asserting no deductions for post-production costs. Doug starts walking landowners through the sample Addendum provision to begin to explain questions and concerns regarding natural gas royalties and deductions and gas companies loop holes. Doug rants on oil and gas Landman tactics on negotiation and seeking to formulate friendships or bonds to maximize pipeline, gas leases, and other agreements for the company. Doug discusses landowners selling oil, gas, and mineral rights to third parties. Doug discussed pitfalls of selling gas rights and problems with sales agreements, bank mortgages, and acceleration of mortgage payments. Encouraging landowners to consult with knowledgeable attorney before ever entering into a sales agreement to sell oil and gas rights to mineral acquisition companies. Please be careful. Royalty issues. Doug discusses extensions and modifications with regards to oil and gas leases. Extensions and modifications may or may not be right for you. How do you know if this situation is right for you? Extensive discussion on how to consider extension and modifications in your leasing situation. Discussion on Gas Lease Addendum Pugh Clauses. Many landowners do not have a full understanding of the benefits and possible detriments of a Pugh clause. Doug explains Pugh Clauses in detail to help the landowner understand this important oil and gas lease provisioned. Also, discussion on differences between ‘pure’ Pugh Clauses and ‘modified’ Pugh Clauses. Understanding natural gas negotiations and fluctuating regional markets. Pockets of active leasing and pipeline activity. Evaluating gas and pipeline company offers in shale regions. Breaking down gas and pipeline landmen job and tactics. Doug discusses the importance for landowners to understand oil and natural gas lease and pipeline offers. Negotiation leverage in pipeline agreement and future impact of bad contracts. Pipeline right-of-way compensation and location issues discussed, what to look for. Doug discusses division orders and the importance for landowners to carefully review unitization documents. Doug explains decimal interests, royalty shares, declaration of pooling and unitization documents (DPUs). What landowners should double check to make sure royalties are paid properly. Having signed an early gas lease in 2007 without knowledgeable legal advisement, we had become increasingly apprehensive as we continued to learn of severe adverse events occurring as a result of gas drilling and pipeline installations. We are farmers raising beef cattle and pride ourselves for being good stewards of this beautiful and unspoiled land. We tried to educate ourselves and were disappointed with some of the lawyers we spoke with noting lack of interest, accessibility and knowledge of the gas/pipeline implications for landowners. We really felt at loose ends and became increasingly apprehensive as the drilling in our immediate area of New Albany became an intense reality. How fortunate we were to read an ad telling of an upcoming presentation by The Clark Law Firm in our area. After communicating with Attorney Doug Clark and his very knowledgeable and supportive wife, Marceea, we realized there really is a landowner attorney who is genuinely interested, informed and dedicated to adroitly advising the landowner. As we proceed in our work with Doug at the helm, we are finally reassured and encouraged to be able to deal with the intimidation and pressure effected by the big gas company leases and related issues. And how wonderful to be involved with really nice, honest and passionate people like the Clarks! If you hear of or see an ad for one of Doug's presentations, be sure to attend as you will come away much better informed and hopeful that there really can be someone watching out for the landowner!